The primary goal of the VetSCOPE1* study was to evaluate the efficacy of VETMEDIN (pimobendan) compared with the angiotensin-converting enzyme (ACE) inhibitor, benazepril hydrochloride, in improving the quality and quantity of life in dogs suffering from overt congestive heart failure (CHF) due to atrioventricular valvular insufficiency (AVVI). Data were also collected to evaluate VETMEDIN safety. There were 3 adverse events in the VETMEDIN group and 1 in the ACE inhibitor group. Diarrhea, soft stool, and vomiting occurred in the VETMEDIN group (1 dog each) and colitis occurred in the ACE inhibitor group. The most common side effects reported in other field studies were poor appetite, lethargy, diarrhea, dyspnea, azotemia, weakness, and ataxia. If side effects should occur, pet owners should contact their veterinarian. VetSCOPE was a blinded, randomized, positive-controlled, multicenter, 56-day study. Dogs were examined on study Days 0 (prior to first treatment), 7, and 56. All dogs alive at the end of the 56-day study period were entered into the optional long-term study. Study dogs were randomly selected to receive either VETMEDIN plus a placebo (n=41) or benazepril plus a placebo (n=35). A subpopulation of dogs on VETMEDIN (n=31) and benazepril (n=25) also received concurrent furosemide therapy. The study animals included 76 privately owned dogs representing 31 different dog breeds. The dogs were presented by owners to 11 different veterinary centers in Europe (Belgium, France, Germany, Italy, Switzerland). 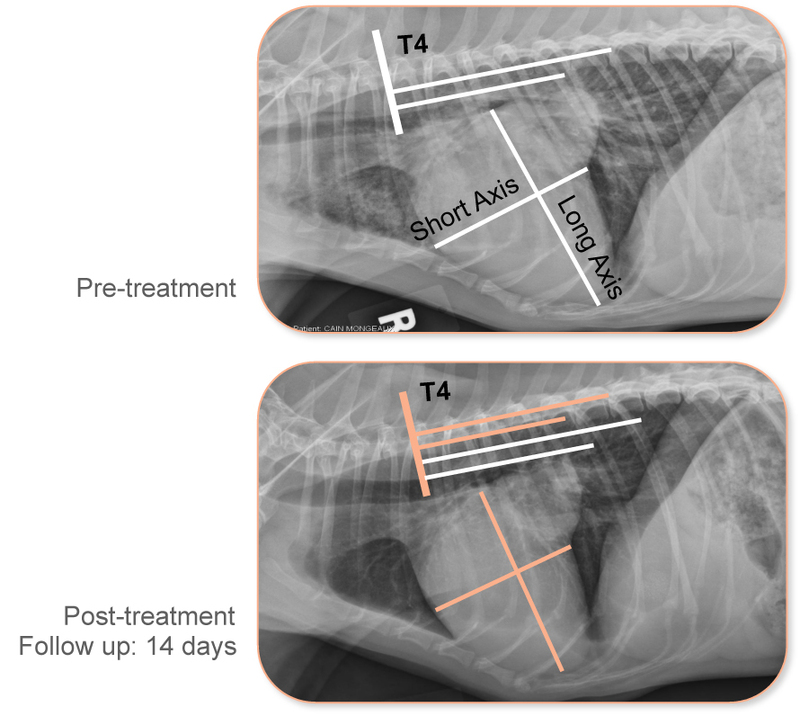 All dogs selected for the trial showed clinical signs of heart failure secondary to AVVI. With VETMEDIN, the overall dose of diuretics decreased from Day 0 to Day 56, whereas with benazepril the overall dose of diuretics increased during the study period. With VETMEDIN use, mean heart size decreased. –0.13±0.64 mean reduction from baseline values. With ACE inhibitor use, there was a slight increase in mean heart size. 0.36±0.58 mean increase from baseline values. A decrease in heart size has been linked to increased survival. Lombard CW, Jöns O, Bussadori CM; for the VetSCOPE Study. Clinical efficacy of pimobendan versus benazepril for the treatment of acquired atrioventricular valvular disease in dogs. J Am Anim Hosp Assoc. 2006;42(4):249–261.